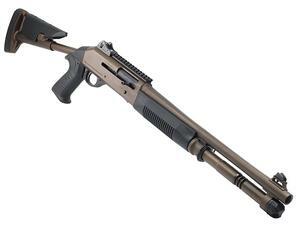 The Benelli M1014 is a limited edition release and features the U.S. Flag engraved on the receiver in honor of this model's use by the U.S. Marine Corps. Currently deployed by the U.S. Marine Corps, the M1014 sets the standard for military shotgun performance. This limited model comes standard with a fixed-position skeleton stock with a pistol grip and cheek piece. Finished in corrosion resistant Midnight Bronze Cerakote. For reliability when it counts, select the M1014 Tactical shotgun.